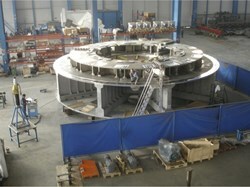 Pre-assembly of the 250-tonne cryostat base for JT-60SA in Aviles, Spain. 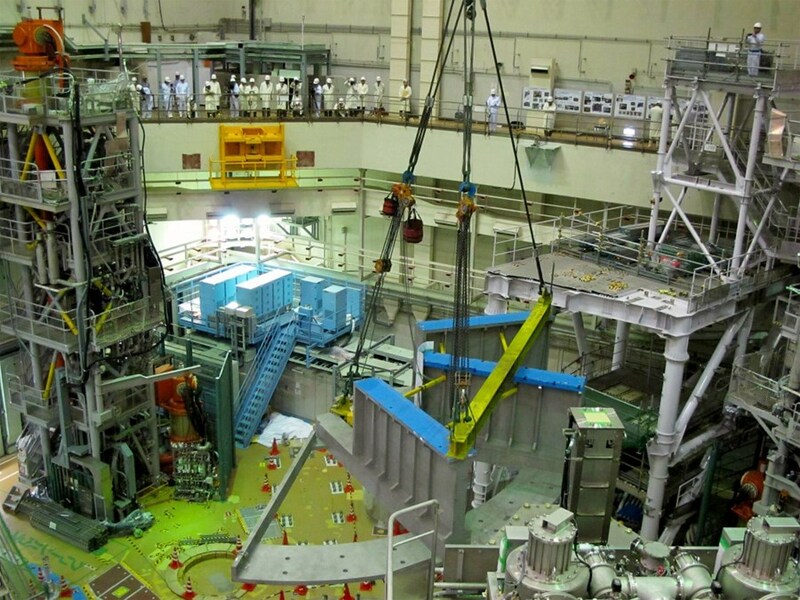 There has recently been much excitement in Naka concerning the assembly of JT-60SA, the "satellite" facility of ITER that will model proposals for optimizing plasma operation and investigate advanced plasma modes that could be tested on ITER or used later on DEMO. On 28 January, tokamak assembly began with the cryostat base, the first major component to be delivered by Europe. This marks a very important step forward for the project, which is part of the Broader Approach Agreement signed between Japan and Euratom, and implemented by Japan Atomic Energy Agency (JAEA) and the European Domestic Agency for ITER Fusion for Energy (F4E). The cryostat base, which supports the weight of the entire tokamak, has a diameter of 12 metres, a height of 3 metres and weighs 250 tonnes. It consists of a double ring in three sectors, a lower structure in three sectors, and an inner cylinder and is assembled using connecting bolts. The manufacturing of the cryostat base was carried out in Aviles, Spain, by IDESA; final machining and pre-assembly was done by ASTURFEITO under the supervision of CIEMAT. At the JAEA Naka Fusion Institute, originally established in 1985, various fusion testing and research facilities are situated in an area of approximately 1.3 km². Here JT-60 started operating in 1985 as one of the largest tokamaks in the world with an outboard diverter configuration using hydrogen plasmas. Its modification to achieve higher plasma current with a single null open diverter was completed in 1991 (JT-60U, U=Upgrade), allowing it to use deuterium plasmas. Since then, JT-60U has addressed the physics issues of reactor plasmas, including ITER physics R&D, and has explored advanced tokamak regimes for a commercially attractive fusion reactor—work which led to the conception of a Steady-State Tokamak Reactor, the SSTR. A negative-ion-based neutral beam injector (N-NBI) with 500 keV deuterons was added to JT-60U in 1996 and in-vessel modifications necessary to the accommodation of a W-shaped divertor were completed in 1997. JT-60U operations ended in August 2008 to start the modifications for a fully superconduting tokamak, the JT-60SA (SA=Super Advanced). Some JT-60U facilities are being reused for JT-60SA, including the beam and radio-frequency heating systems, power supplies, water cooling systems and diagnostics. Anticipation had started to build already in November 2012 with the final pre-assembly of the cryostat base at the manufacturing facility. An accurate dimensional tolerance check was performed with a 3D portable laser tracker, and results proved to be satisfactory with low error under the limits. By 8 November, the manufacture was completed and all parts of the cryostat base were packed for transport. Due to their large size (maximum width 6.5 m), the pieces were difficult to transport, especially by road, but fortunately the factories where the cryostat base was fabricated and machined were close to one another as well as to the port. The cryostat base was collected from the factory on 12 November and transported to the port. After loading the cryostat base on board the IYO, the ship set sail on 22 November and took on further cargo at other European ports before heading across the Atlantic and Pacific oceans via the Panama Canal. After the 18,000-km-long sea voyage, the cryostat base finally arrived at Hitachi port in Japan on 16 January 2013. One of the lower structure sectors of the cryostat base as it is assembled in the torus hall on 28 January in the presence of the media. The transport from the port to the Naka Fusion Institute was conducted by JAEA in seven stages during the week starting 19 January. Transport was carried out before dawn on closed roads All seven pieces of the cryostat base were delivered to the assembly hall at the Naka Fusion Institute by 26 January. 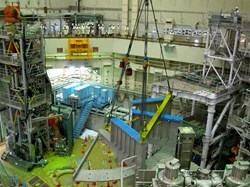 Tokamak assembly began two days later. The start was open to the press and reporters from ten media organizations were able to witness the first assembly work. This event was widely reported to the public through newspapers, web, and TV, including the national news. This timely start to the assembly of the JT-60SA Tokamak is the beginning of a six-year assembly and commissioning period which will enable the first plasma to be achieved in March 2019, ready for this project's role to support and complement ITER.